Music lovers everywhere: it’s time to tune in, turn the volume up, and celebrate because Thursday, August 20 is National Radio Day. This holiday has been celebrated since the early 1990s on Aug. 20, honoring the day the first news radio station, 8MK radio in Detroit was licensed by the FCC and went on the air in 1920. But this year’s event is going to be the biggest yet, as dozens of noncommercial stations across the country will be participating. 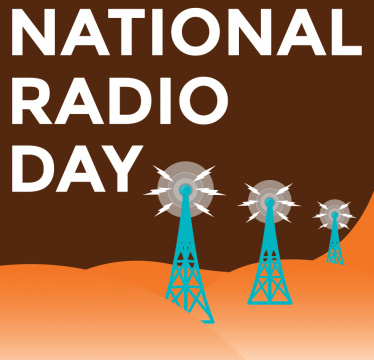 And you can participate too by visiting www.nationalradioday.com. For FMC, it’s also a day to highlight some of the ways that noncommercial radio and music communities can support each other. Noncommercial radio stations (including community, college, and public stations) are often the only place on the dial where you can hear certain genres of music. They highlight a diversity of creative expression, often with a local angle and expert curation that you can’t get from an algorithm or a playlist on a commercial music service. It’s only natural that independent labels and local musicians are among non-commercial radio’s biggest supporters. Already, we’re seeing music folks and new LPFM stations working together in exciting new ways. That focus on collaborative solutions is something we’re also seeing in the growing support in the broader non-commercial radio community for the Fair Pay Fair Play Act, a piece of legislation that would finally fix the longstanding loophole in federal law that allows performers and labels to go uncompensated when artists. Respecting the special role of noncommercial broadcasters, the bill would add only a nominal $100 annual fee for these stations. But it would also unlock 50 million dollars a year for artists in international royalties alone—money that artists have earned but can’t currently be collected due to international reciprocity rules. On Thursday, different stations are celebrating in a variety of ways, hosting a “radio relay”, airing special “Sonic IDs”, and inviting their community over to visit the station and have a cool glass of lemonade (not coincidentally, it’s also National Lemonade Day!). Seattle’s Central Public Library will even be host to a pop-up youth-run station complete with an interactive radio tower. Radio remains an immensely powerful tool for music discovery, and for community connection even as the listening environment is changing fast. We’ll be convening a panel of some of the leading voices in radio, both terrestrial and digital, for a dynamic conversation at the 15th annual Future of Music Policy Summit on October 26 and 27 here in Washington DC. Check out the full details! What will radio look like ten years from now? How can lean-back listening continue to deliver diverse and exciting music to fans while maintaining a productive relationship with those who create music? These are some of the questions we’ll be asking, and we’d love to see you there!